Politicians must be the only people in America who "believe" that money doesn't influence their decisions. We know that when company cash flows freely and lobbyist armies are on the march, corporations win politicians’ favor and change the outcome of elections. The US Supreme Court made influence-peddling even easier when it decided to allow corporations to spend money directly on campaign advertising - opening the floodgates to excessive spending. 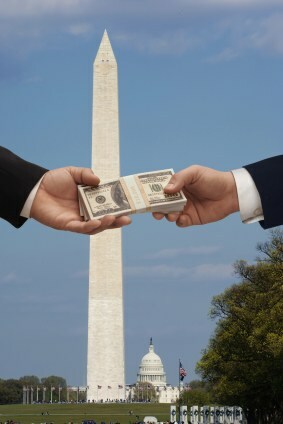 Dirty Money Watch connects the dots between money and power. Exposing secret spending: The Chamber of Commerce funneled $3.8 million into ads to influence the California insurance commissioner’s race – to hide the fact that the money came from the insurance industry. Taking on the big-money players you've never heard of: Consumer Watchdog ran a Times Square Jumbotron ad calling out Koch Industries, the anti-environment Tea Party funder. The oil giant poured money into funds to deny climate change exists, including $1 million given to trick California voters into rolling back the most comprehensive greenhouse gas emission caps in the nation. Shining a spotlight on Wall Street spending to cripple financial reform in the U.S. Senate and House of Representatives. Releasing analyses of health insurer efforts to influence health reform proposals in California and Washington, D.C.: The health insurance lobby's millions in campaign contributions and lobbyist paychecks blocked efforts to cap what health insurers charge and create an affordable public alternative to private insurance. See Sacramento, and D.C.